Mark Papermaster just confirmed what SemiAccurate has been saying for years, AMD is opening up Bobcat to 3rd party IP. This is a much bigger step than most people realise, and will change the way things are done. If you have been following SemiAccurate, you will have seen all the pieces being put in to place. AMD started out with Bobcat, a synthesizable core like ARM. From there, the pieces have been put in to place step by step, ending up with FSA/FSAIL, now called HSA (Heterogeneous System Architecture) (NOTE: If you don’t need immediate coverage, you can always wait for RBS’s Didier Scemama to plagiarize us a few days later. We are curious as to see what fundamental pieces of this he gets wrong in his next ‘independent analysis’. More on this later.) 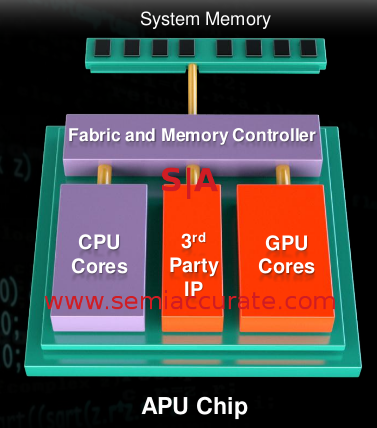 In short, AMD is opening the IP up in a way similar to ARM, but not quite. Update 2/3/12 7:30pm: Clarification – We did not mean AMD is licensing out Bobcat IP, and stated that below, simply that they are opening Bobcat to 3rd party IP. This does not preclude AMD doing so, but as we have been saying for a while now, it is simply much easier for others to give AMD blocks and have them make it. The implications are huge, and while AMD is unlikely to license out cores and GPUs like ARM cores, they will give companies enough to reach the same goal. You can now design an accelerator, co-processor, or anything else, and have it made in an x86 core with cutting edge DX11 GPUs. With FSAIL, you can even take the same IP you have in an ARM CPU and slap it in to a Bobcat with very little change. While HSA isn’t anything like ARM’s licensing model, it may in fact be easier to implement. Why? With ARM, you have to worry about the whole chip. With HSA/Bobcat, you just need to make the IP block you want made, AMD does the rest. On the down side, you can’t change the rest with HSA, you can in ARM. What is best for you the customer?